133 min. Disney/Lucasfilm. Director: Gareth Edwards. Cast: Felicity Jones, Diego Luna, Alan Tudyk, Ben Mendelsohn, Donnie Yen, Mads Mikkelsen, Wen Jiang, Forest Whitaker, Genevieve O'Reilly, Jimmy Smits, Riz Ahmed, James Earl Jones. At last, the Star Wars cinematic universe has expanded, with the successful experiment Rogue One (subtitled in the marketing, but not on screen, as “A Star Wars Story”). The first of the so-called Star Wars anthology films, Rogue One takes place mostly in the year or so before the events of George Lucas’ initial 1977 Star Wars film (a.k.a. Star Wars: Episode IV—A New Hope), and it is a time of treachery. Although Star Wars sprang from the Flash Gordon serials like Athena sprang from the head of Zeus, Lucas’ space operas share with his Indiana Jones franchise a fascination with WWII lore, with Rebels (Allies) versus “the Empire” (the Nazis and Axis powers). Star Wars took direct inspiration from the behind-enemy-lines "men on a mission" pictures of his youth, like 1955’s The Dam Busters and 1961’s The Guns of Navarone. And so, in more ways than one, Rogue One brings us full circle, to where Star Wars began. In its murkier moral tone, Rogue One perhaps best resembles the next wave of WWII action-suspense pictures of the 1970s (including Force 10 from Navarone, with none other than Harrison “Han Solo” Ford). And so this new Star Wars picture, directed by Gareth Edwards (Monsters, Godzilla), concerns a scrappy band of heroes and anti-heroes, "spies, saboteurs, assassins" of the Rebellion on their own behind-enemy-lines missions to resist the Empire. Word is that the Empire—under the leadership of Darth Vader (again voiced by James Earl Jones), Governor Tarkin (a CGI recreation of Peter Cushing), and Orson Krennic (Ben Mendelsohn)—has begun construction on “a planet killer,” the now-infamous Death Star. And so, off she goes, a sister whose multicultural band of brothers comes to include Captain Cassian Andor (Diego Luna); the probability-calculating, reprogrammed Imperial droid K-2SO (voice of Alan Tudyk); Force-worshipping blind swordsman Chirrut Îmwe (Donnie Yen, doing his best space-Zatoichi) and his assassin buddy Baze Malbus (Jiang Wen); and turned Imperial pilot Bodhi Rook (Riz Ahmed). And at least six familiar faces from earlier Star Wars films play small roles or make cameo appearances, just one reason why Rogue One will give die-hard Star Wars fans multiple orgasms. Another reason can be found in the “Story by” credit, shared by Gary Whitta (The Book of Eli) and John Knoll. Knoll’s name stands out, as this is the first writing credit for the prominent ILM visual effects supervisor. Although the screenplay credit belongs to Chris Weitz (About a Boy) and Tony Gilroy (the Bourne films), Knoll’s placement emblematizes the film’s true raison d’être: to give us X-wings dogfighting with TIE fighters, stage laser-gun fights, and bust out everything from Star Destroyers to AT-ATs to, yep, a lightsaber. Rogue One runneth over with Star Wars spectacle. Not that there’s anything wrong with that, except that Rogue One's foregone conclusion of a story would work better if it spent more time warming up the emotional connection to its characters and sharpening up its moral relativism—although the sunny theme of "a new hope" admirably comes at a price. The earlier Star Wars films retain an advantage over this one in letting the action breathe enough for us to feel we’re getting to know the characters (even when they’re empty vessels). In this respect, Rogue One feels a bit claustrophobic, and Jyn Erso a bit remote, in spite of her daddy issues and arc of moral awakening. It's Star Wars, so it's graded on a curve, and it's unfortunate that Edwards' vision for the film appears to have been diluted by here-and-there corporate pandering. But let's face it: this is a movie to see—and hear—big and now. Add a stylish Michael Giacchino score (after John Williams), Edwards' eye for detail (rain spattering on a laser-gun sniper rifle), and the kind of expansive world-building production-design The Force Awakens ceded to pure nostalgia, and you get a Star Wars film that looks to the future while taking us once again to the “long time ago, in a galaxy far, far away” past. 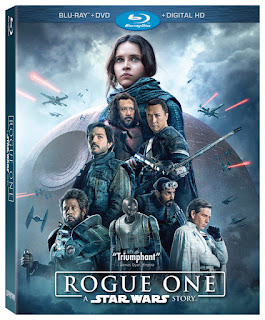 Disney transmits Rogue One on Blu-ray in a Blu-ray + DVD + Digital HD special edition boasting reference-quality A/V and eleven quality featurettes. (Retailer exclusive editions offer a 3D Blu-ray disc and, in one case, two short featurettes, but these were not made available for review.) Simply put, the picture quality and audio here are perfect, maximizing what's possible in Blu-ray hi-def presentation. The digital-to-digital transfer, from a 4K source, yields a film-like but spectacularly detailed image, faithfully rendered and beautifully resolved in color, contrast, black level, texture, and overall sharpness and depth. The lossless DTS-HD Master Audio 7.1 mix proves similarly state-of-the-art. There's a reason why Skywalker Sound has piled up so many Oscar wins and nominations, and Blu-ray is just the format to showcase a mix like this for home theater presentation. Every laser blast and explosion comes through with pinpoint clarity and careful placement in the complex and robust soundscape, alive with environmental ambience and rich musical depth without every sacrificing prioritization of dialogue. Adding to the success of the A/V treatment is the choice to put the film on one disc, and bonus features on a separate Blu-ray disc. Bonus features lack a commentary from Gareth Edwards (something perhaps held in reserve for a future double-dip?) but include a satisfying series of focused featurettes. "A Rogue Idea" (9:00, HD), for example, focuses on the early development of the project, from John Knoll's concept to the involvement of Edwards as prime mover. The next group of featurettes focus on a character or characters, in writing, history, personality, actor's interpretation, and design: "Jyn: The Rebel" (6:16, HD), "Cassian: The Spy" (4:14, HD), "K-2SO: The Droid" (7:43, HD), "Baze & Chirrut: Guardians of the Whills" (6:20, HD), and "Bodhi & Saw: The Pilot & The Revolutionary" (8:35, HD). Similarly, "The Empire" (8:18, HD) clusters and examines the film's Imperial characters: Galen Erso, Orson Krennic, Grand Moff Tarkin, and Darth Vader. "Visions of Hope: The Look of Rogue One" (8:24, HD) gets into the film's distinct design choices (in environments, sets, costumes, ship design) that fit into but expand the previously existing Star Wars universe. "The Princess & The Governor" (5:49, HD) touches on the film's most controversial element: the CGI recreation of two characters from A New Hope. "Epilogue: The Story Continues" (4:15, HD) is a promo-style piece with red-carpet premiere footage, fan excitement, and film clips whipped up into four minutes of puffery. Brief but highly appealing, "Rogue Connections" (4:31, HD) connects some of the Star Wars universe dots for the non-obsessive, pointing out Easter eggs, references, and the like. All site content © 2000-2019 Peter Canavese. Page generated at 04/18/2019 01:54:39AM.